One day down on the farm, Duck got a wild idea. "I bet I could ride a bike," he thought. He waddled over to where the boy parked his bike, climbed on and began to ride. At first he rode slowly and he wobbled a lot, but it was fun! Duck rode past Cow and waved to her. "Hello, Cow!" said Duck. "Moo," said Cow. But what she thought was, "A duck on a bike? That's the silliest One day down on the farm, Duck got a wild idea. "I bet I could ride a bike," he thought. He waddled over to where the boy parked his bike, climbed on and began to ride. At first he rode slowly and he wobbled a lot, but it was fun! Duck rode past Cow and waved to her. "Hello, Cow!" said Duck. "Moo," said Cow. But what she thought was, "A duck on a bike? That's the silliest thing I've ever seen!" And so Duck rides past sheep, horse, and all the other barnyard animals. Suddenly, a group of kids ride by on their bikes and run into the farmhouse, leaving the bikes outside. 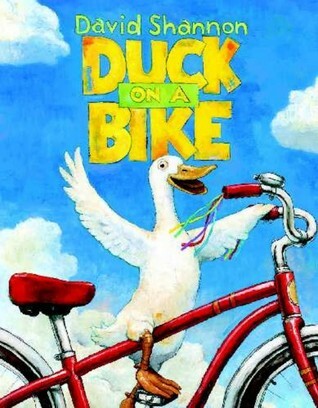 Now ALL the animals can ride bikes, just like Duck!